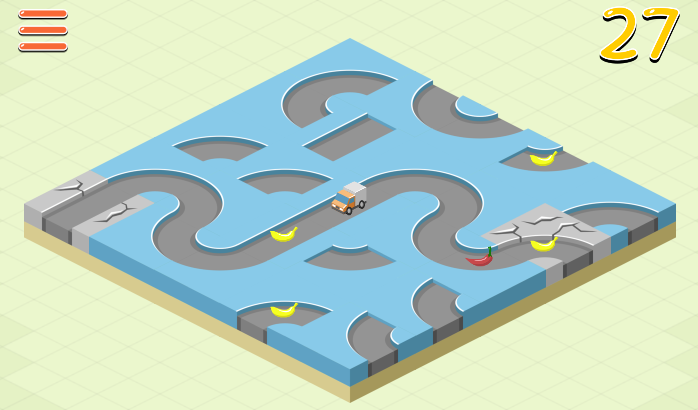 Bananadoh by Atqu.in is an action puzzle featuring a truck that has lost its bananas. 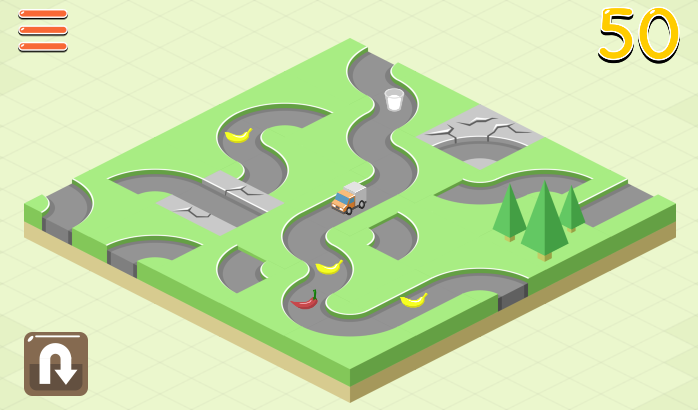 Bananadoh is an action puzzle featuring a truck that has lost its bananas. Rotate tiles in order to keep the truck on the road as it journeys through a colorful game world, and relish in the fruits of your high-score. 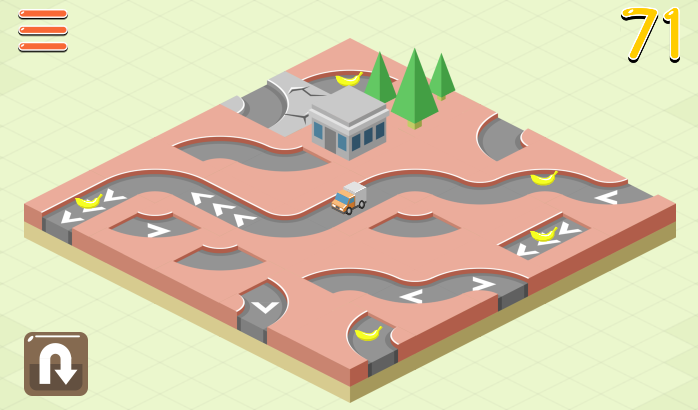 Bananadoh features a range of unlockable tiles and pickups, and every level is procedurally generated ensuring a unique experience each time you play. bananadoh is free to play on the web, iOS App Store and Google Play. Bananadoh reminds me of the classic game Pipe Dream. It has the same game mechanics though with different theme and setting. 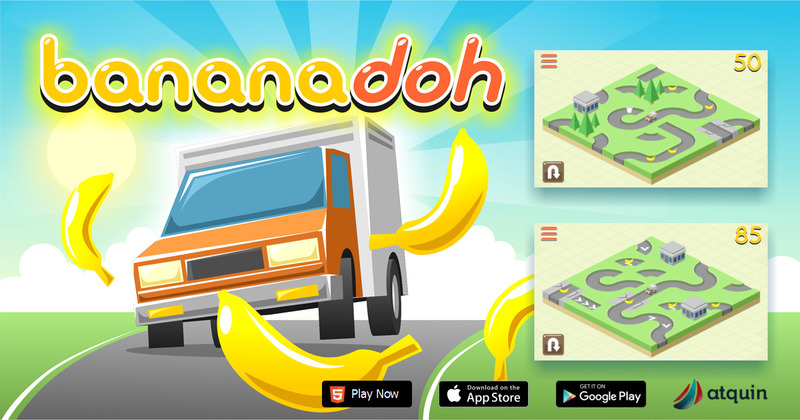 In Bananadoh, you are a truck driver who needs to collect as many bananas as possible. The catch is that you need to create a path for your truck to reach the bananas (or chillis for extra points) by tapping on the road. By tapping a piece of a road, you will rotate the road. Adjust it until to connect to the next road and so on. It sounds very easy, but it is apparently much harder to do especially on the hard setting where the truck moves a lot faster. One complain about Bananadoh is that it is easy to tap on the wrong piece of the road which cause a loss of precious time. This is especially frustrating on the higher level. I would suggest the developer would highlight the tile piece as the mouse hovers on it. That would ensure that players are clicking on the correct piece of the road. Overall, Bananadoh is simple and enjoyable. It's a fresh take of the old game, Pipe Dreams. For future development, we would suggest more fruit types and maybe more obstacles or even monkeys who will chase your truck and eat the bananas!